“On the contrary, sanctions, as a rule, end up punishing the population rather than the government. This is inexcusable,” she added, reminded of a very negative example in Latin America – a 50-year-old US embargo against Cuba which Brazil never supported and instead deepened its cooperation with Havana. 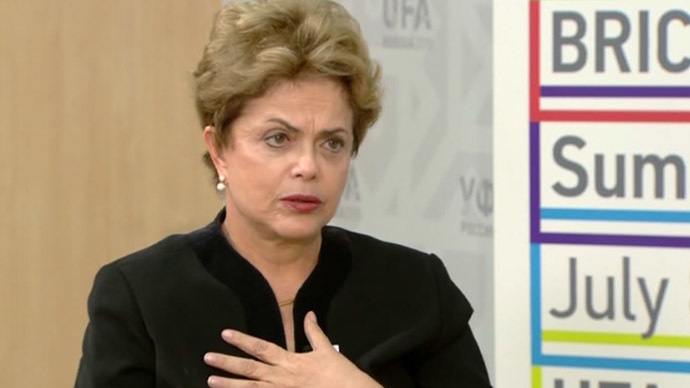 As for the sanctions against Russia, Rousseff confirmed that Moscow can count on Brazil in overcoming their effects, and said the issue was discussed during the BRICS leaders’ meetings. The ongoing BRICS summit has already yielded “excellent” results, including a series of measures to kick-start the New Development Bank and the creation of a reserve currency pool for the bloc members. “Thus, I’m sure, the BRICS summit was a success, and that in addition to its excellent organization, which I mentioned earlier,” Rousseff added.